When I approached Michelle Edgemont about doing a small Valentine’s Day inspiration shoot together, I knew going in what our shoot would NOT be: pink and girly. Now don’t get me wrong, I love all things pink but I felt like Valentine’s Day was in need of some edgier, more sophisticated inspiration. Fortunately, Michelle was on the exact same page, with visions of a moodier, more editorial shoot on her mind. And I knew the perfect photographer to bring on board, Chi-Chi Ari. 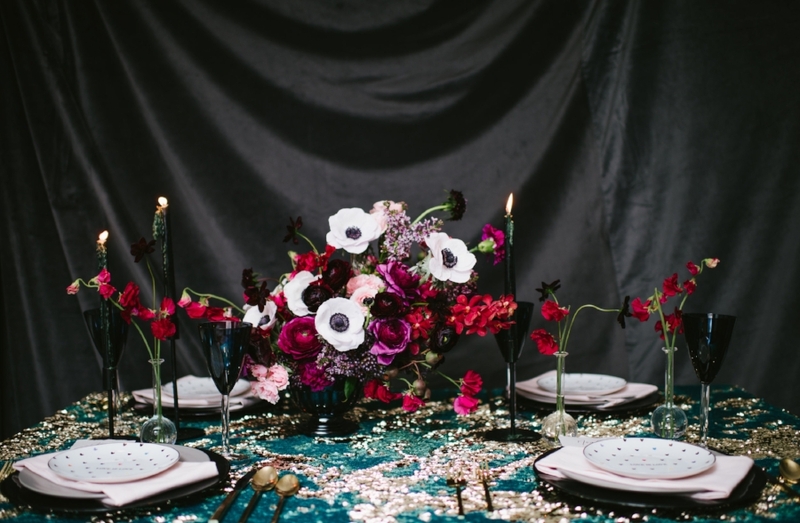 We knew we wanted to shy away from the classic Valentine’s Day color palette, so for our first tablescape, we chose a turquoise and gold sequin linen from Nuage Designs (it’s actually their koi linen which switches between colors with a swipe of your hand) as our foundation. We then set the table with neutral plates and glasses plus a pale pink napkin from Broadway Party Rentals, topped off with West Elm’s “Love Is Love” plates. I stumbled upon the plates in a West Elm over Christmas and when plans for this Valentine’s Day shoot started to materialize, I knew they would be the perfect addition. Not to mention that a portion of the proceeds from West Elm’s sale of all of their “Love Is Love” products goes to the Human Rights Campaign. We also brought in Juliana from Ink + Nibs to create calligraphed place cards for a romantic touch. 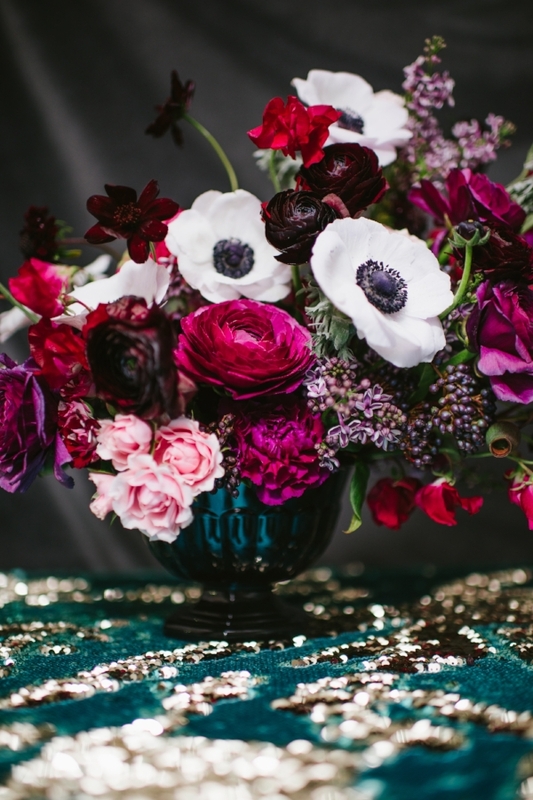 Michelle then crafted a gorgeous statement arrangement filled with anemones, roses, ranunculus and other florals in shades of red, pink and purple to complete the look. One of the things I love about working with such creative and talented people is the opportunity to create on the fly. While we had planned to photograph a second tablescape using another one of Nuage’s linens, we hadn’t planned on giving that table a whole new look. But on the spot, Michelle had an idea in her head and together we executed a really stunning grey tablescape with strong pops of red. It read so clean and sharp…I was so impressed with what she had come up with! We traded out the pink napkins for white napkins with black hearts, accompanied by Ink + Nibs’ menus and left all of the color to the flowers. I hope that you find a little inspiration of your own from what we’ve created!